It feels as if we have been in a time warp with the days passing in a pleasant, soft blur. It may be a travel truism but we often have to stop for a moment to recall the day of the week and where we were last week. In the last two months, we have driven over five thousand miles, visited seven states (well, eight if you think, as most Texan do, that one Texas is at least equivalent to two ‘regular’ states), toured at least seven national parks/monuments, enjoyed many lunches and ‘stretch’ breaks on quiet back roads and reveled in the splendor of simply stunning scenery. Tonight we are back at one of our favorite places, a little state park in the high desert of southern New Mexico. Striking landscape, incredible sunsets, warm days, cool evenings, wonderful night skies and the place is almost empty. The monster motor coaches are non-existent, apparently preferring creature comforts over beauty. 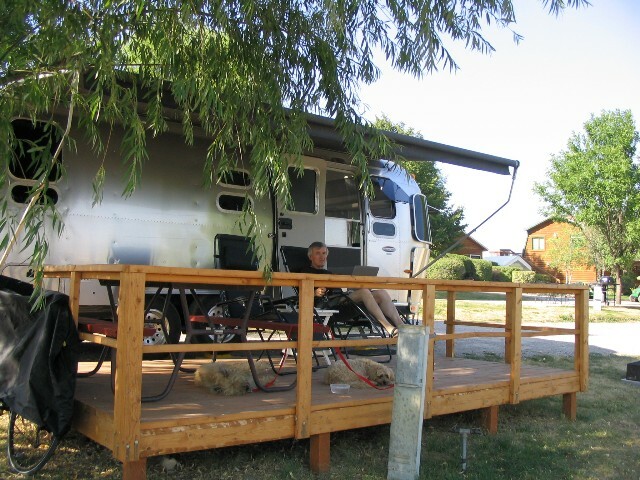 We even have a neighbor in another Airstream which is quite unusual. So how are we doing? Splendidly! Kathy is doing very well and this type of travel agrees with both of us. We have absolutely no regrets about the decision to undertake this odyssey. And it really is an odyssey since one of the primary objectives of our journey is to find the place where we will build our next home. We have discovered that we really enjoy quiet, even remote, places and that the high-intensity life we led in San Francisco is no longer as appealing as it was just a year ago. Invariably, after a few days in a large city, we look forward to heading back out into the hinterlands. I really don’t think we are inclined to become recluses but we have the good fortune to be able to choose a place to live where relentless traffic and super-sized everything (stores, SUVs, RVs, people) need not be a part of our daily routine. The search continues but lots of sunshine and a sense of visual spaciousness are key criteria in our search. We are still working on whether we can deal with cold winters since almost 20 years in California have made us confirmed weather wimps. National Parks: It was somewhat unplanned but we ended up visiting many of the major national parks and monuments in the West (Grand Canyon, Bryce Canyon, Zion, Capitol Reef, Arches, Canyonlands, White Sands and Big Bend) with what seemed like hundreds of rented RVs full of Europeans dashing from park to park. When you see an RV labeled ‘Cruise America’ or ‘1-800-RV4RENT’, it’s an even bet that the driver speaks German or French. Nice, quiet travelers and I’m delighted to see them enjoying our parks while helping reduce our trade deficit. Our favorite parks — Big Bend and Capitol Reef. Really stunning vistas and not too many people. The former is quite remote and its harshness is almost breathtaking. Definitely an acquired taste since it’s not your typical park. On a positive note, its very remoteness means the usual tacky tourist joints simply don’t exist just outside the park entrance as they do with most national parks. Terlingua, Texas, is the western entrance to Big Bend and it’s definitely not even far enough up the scale to qualify as tacky. It’s simply a dumpy little West Texas town with a down-at-the-heels motel and RV park. Refreshing if you don’t need to spend much time there. Texas: Texas deserves it’s own entry. Incredible variety. We came in through Pecos, stopped for coffee Marfa (remote and as charming as the NY Times article described) on the way to Big Bend, dashed over to San Antonio where I flew up to Denver for a sales call, spent a couple of days in Austin so we could have dinner with a friend and his wife, stocked up with groceries at the home of Whole Foods, headed back west through Hill Country, passing through El Paso (an unpleasant place) on the way to tonight’s stop. People in Texas are quite pleasant and I found myself striking up random conversations with people. Very out of character for me since I have spent years cultivating my curmudgeon persona but obviously there is something in the Texas water. Texas is probably not on our list of places to settle but it’s definitely an interesting place to visit. I don’t think it was the three-foot snake meandering through the luxury RV park in Kerrville that put me off Texas but the ‘Snakes of Texas’ book prominently displayed in the travel section of Barnes & Noble in San Antonio did give me pause for thought. Certainly not your typical California travel section with a surfeit of wine books. We made a short visit to this small farming community in Eastern Washington to visit Kathy’s brother and her 92-year old mother who resides in small facility for Alzheimer patients. Surprisingly good farmers market which filled our small larder and even smaller refrigerator. Regular grocery shopping and stopping at all roadside produce stands are part of the travel routine. It’s very difficult to dine out in most small towns when one of us (Kathy) is vegan and I’m vegetarian. Restaurants do make an effort but eating a plate of iceberg lettuce smothered in high-fat dressing and with a side order of high-carb potatoes does not constitute a proper, balanced vegetarian meal. I also tested the virtual office Wednesday morning by participating in my board meeting as Paremus CEO. Not really too much different than other telephonic board meetings I have attended. If you avoid the throngs of tourists, this park offers truly stunning vistas. Driving up the Going to the Sun Highway is de rigueur for all tourists and we started early enough to avoid the worst of the traffic. It’s quite an amazing piece of road construction, a legacy of the Depression-era WPA program, that would never be built today. A mild case of vertigo made me think better of returning down the same road and we headed east. A good decision since we left the high-density tourist stops behind and discovered the open spaces on the east side of the park. Two million visitors a year and we managed to find a delightful, quiet place for picnic lunch with only one other group in the area. Tourists are so predictable that it becomes quite easy to avoid them and still enjoy the park. Net-net, Glacier was definitely worth the visit but, after two days, we’re ready to move on. So, is this our ‘new normal’? After two weeks, it certainly feels right and we have found ourselves using the term ‘home’ to describe the place where the trailer is currently hooked up. 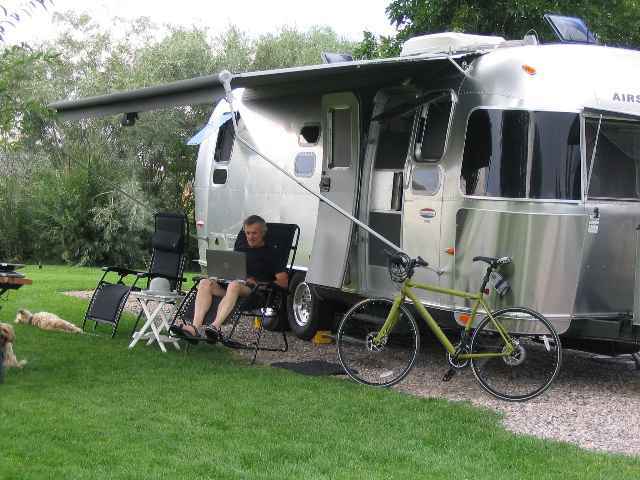 We have discovered that it is possible to live comfortably in a small RV and do productive work while traveling through some incredible scenery. For the immediate future, this is our life — high-tech vagabonds. We plot our itinerary a few weeks travel in advance with WiFi hotspots and cell coverage in mind for at least 80% of our stops. RV envy — is bigger really better? Do we really need all that stuff is our storage unit in Petaluma?